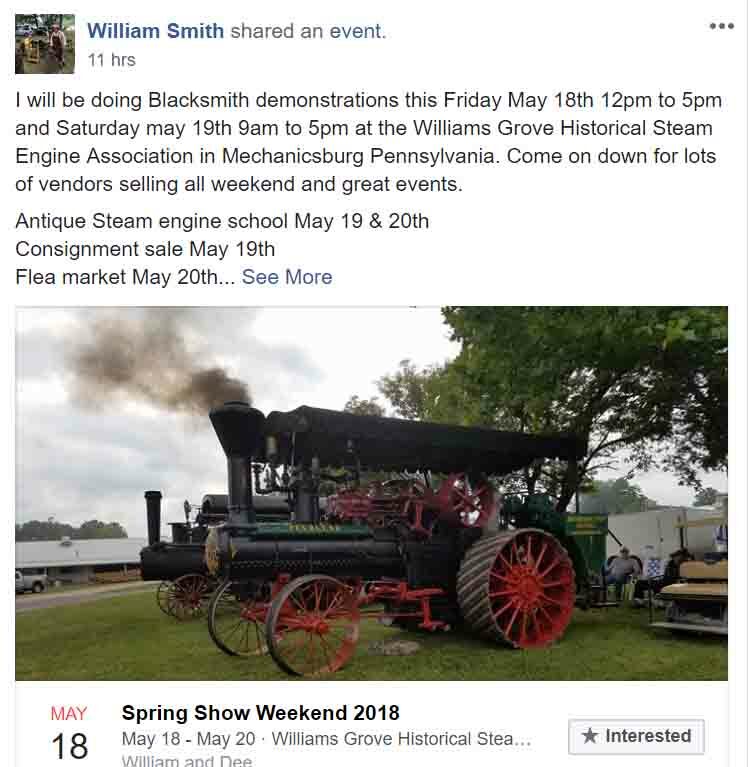 May Newsletter of the Williams Grove Blacksmithing Group - The Iron Forge Fire Blackmithing Forum. Naturally, if someone else has the burning passion to write the newsletter, I would be happy to assist them in taking over the newsletter. Thank you David. This is a superb newsletter. Job well done. Thank you. This newsletter revived the desire to forge small objects. I made celtic pins a few years back. They are fun to make. Rob, My expectation is that Will will likely welcome the company and assistance. I'll be there on Sunday. I plan to reset the anvil this week. Has anyone shown interest in Friday or Saturday? Don't forget that we also advertised a group meeting for Sunday May 27th. - adapters in 1/8" increments for the anvil's hardy hole. These will give us a good idea of what would fit in the tapered hole of the hardy hole of the anvil in the blacksmith shop, and serve as a temporary solution. A combination of two of the adapters should work. I'm still working on finishing a pair of "Quick Tongs" for holding RR spikes, for forging the ends into bottle openers. Hello David. William, Steve, Rob, and myself (victor) are planning to be there. I'll email everyone this weekend to confirm availability and best times to make a schedule. Group meeting on for Sunday. May I conclude that "Group meeting on for Sunday" still means May 27th? On the 27th, I'll bring along some of that Wertz Smithing coal if it will help. If you want to bring the coal we can compare how it burn to the coal currently at the shop. I would find it interesting. The spring weekend show will be here in a few days. I will send an email to those folks who's email I have. I would like to get everyone on the same page here at the forum to keep communication simple. You can elect to receive emails when others post to a thread. This can help keep everyone in the loop. That said. I do have a new stump in the back of my truck. I hope to reset the anvil tomorrow. That will depend on what time I get off of work. Thursday is out. So it will be Sunday at the latest if I don't get it done Wednesday. There is a group meeting on Sunday. Show up at 9:00 to get things started. I'm not sure we have anyone in the Forge on Friday. Will Smith will be in on Saturday. If you can post times that you can be available it will help coordinate a schedule . I hope there's a time slot that works for everyone. We will get things smoothed out as we get into a regular groove. I can help any of the 3 days the show is running. Will Smith posted this information about when he plans on being at this weekend's event, on Facebook. A little confused. Since Will Smith is not demonstrating on Sunday, 20th (per Facebook post). For whom will I be striker/apprentice on the 20th? Or was the meeting moved from 27th to 20th? I'm confused too. Has the monthly meeting been moved from the 27th to the 20th? Grandadz - Victor said he will be there this Sunday. Ok. Looks like rain, rain, rain, this week end. That can be a good thing or bad. We will see. So, I did get new stump in tonight. The anvil face is sitting 30" above the ground. So I hope this fits most of us hitting on it. The stump is still green and I expect it to dry and possible shift over the summer. The stump has not checked so I think we can treat it on Sunday to slow the drying process down to prevent checking. I needed to shim one side so it sat flat. I'll bring the sander on Sunday to level it off perfect. Meanwhile we do not need to worry that a 400 plus pound anvil will topple now. Plus it's level. An added bonus was someone let a chain wrapped around the tree and the tree grew over it. That's right. The chain on the anvil base now goes right into the stump. Hope to see everyone on Sunday. Victor, are you changing the meeting date for the group from May 27th to May 20th? That is what it sounds like. .... If so, then anyone that comes to the shop on May 27th expecting a meeting due to reading the newsletter that I have published on Facebook groups advertising that meeting date will not be happy, and we could loose prospective member(s) who show up to an empty building. At least one person has told me that he plans on coming on May 27th for the first time. .... I hope that I am mistaken about this and that the official meeting date is still May 27th. Group meeting this Sunday. We can do a auxiliary meeting the 27th as well. Victor, thank you. It is important that potential new members, and current members, can count on the last Sunday of the month, which are the dates advertised, to be predictable and dependable dates to come and participate. I would humbly but strongly suggest enforcing people wearing safety glasses and wearing ID badges to use, or even be near, the equipment in the blacksmith shop. The reason for safety glasses is obvious, if someone hurts themselves and was allowed anywhere near the equipment, they could sue and people could loose their homes and other financial assets. The ID badges are for the same reason. If someone is wearing a membership ID badge, then it is easier to quickly identify someone who is approaching the equipment who has not signed the appropriate release form and not covered by the WGHSEA liability insurance. ID badges also help develop interaction, socialization, and name recognition. Since I bought the stuff to make ID badges, if I am provided with additional names, I can make additional badges for new people. That is why I spent time and money making ID badges and purchasing temporary sticky IDs for people who recently registered as members, as well as guests. We may need to consider having a bunch of cheap safety glasses in a box to lend to people that don't bring them.